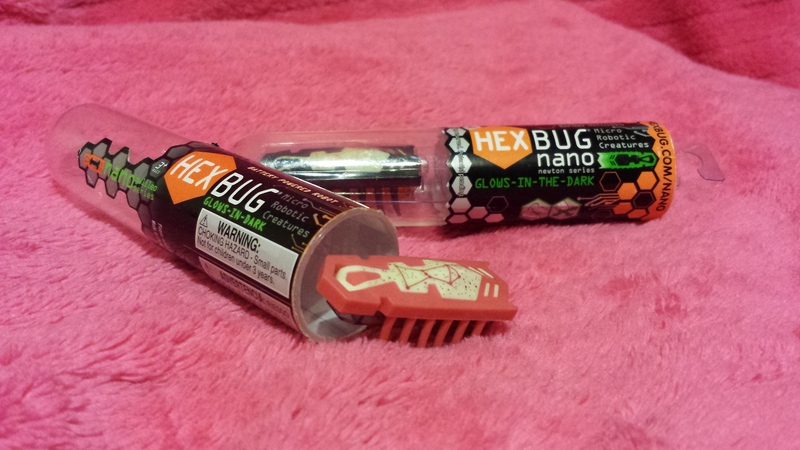 In the Booty Box we recieved two Hex Bug Nanos were included. I’ve seen these toys in the store but had never really paid attention to them. I brought one down to my role playing group because there were going to be a couple kids there hanging out. I didn’t have time to fiddle with it. Bringing it down to game I pulled it out of the package and turned it on. I was like… ok it vibrates. Raight….. Placing it down on the table I was amazed and delighted. The particular RPM speed of the little motor inside really made the little robot move like a bug. They use some sort of latex or silcon for the legs. When the motor is on, the vibration causes the legs to move with a behavior type just like a cockroach or beetle. The robot doesn’t work on soft surfaces like carpet, hair, fabric couches, children and some paper. This is their first version of bugs. The new version actually climbs. I am curious enough I might go buy one. This most basic version of their robotic bug glows in the dark and has no sensors that I can find. While playing with the toy it seemed at times to actually SENSE something in front of it and change direction before bumping into it. This was pretty random though. At other times it would run off the table or run into things repeatedly. We were amused with it when the kids were done playing with the bug. Here is a link to the video we posted to Facebook. The company does have other creactions, like the robotic Larva. The Larva model senses the world around it and avoids collisions. The robotic crab can sense light and will move towards shadow. Several of their newer models actually react to sound, movement and touch. All of them seem to be designed to flip back over when stranded on their back. (Look out Replicants, they might make a turtle that walks through the desert.) I was impressed by their variety. They have ants, scarabs, beetles, the nanos, spiders, inch worm and larva. They also have a completely aquatic fish. The most affordable of the toys start at $5.00 and the remote controlled XL version of the spider and scarab go up to $40.00. Even on the higher end, these toys are very affordable. The company has designed habitats for their robotic creations to traverse. The habitats can be built up with tracks running between them. When I was a kid, robotic toys were not this interesting. You played with them for a while and then forgot about it. I had one toy that was three monkeys on a slide. The motor would help the monkeys climb a tree, they would do a flip and then slide down a curly slide. The pattern would repeat and I would go back to playing with My Little Ponies. It was a cool toy, more for display and rather old fashioned. We also had slightly robotic dogs and toys and pets but nothing this sophisticated. I could see a child becoming really attached to a Nano or other robot in the same way we did with our dolls or stuffed animals. They seem to have some sort of intelligence, even if it’s an illusion. Even if that intelligence is purely in our imaginations from trying to make sense of observed, relatable behaviors. The brillance behind this toy is that it plays on our need to anthropomorphize anything that moves and appears alive. How many people do you know that bought a Zuzu pet for their kids in the past five years? That was because it looked like a familiar small furry hamster that we assigned to an emotional place in our minds. These toys take that evolution a step farther. They have behaviors and can enteract on some level with the environment and with your child. The next few years will probably bring huge leaps in the field of robotics. It’s already amazing what they can do and how they can make us feel. On a nerdy level.. their body design reminds me of the Descepticons… robotos in disguise. The nerdy easter egg is the constellation Orion on the body. 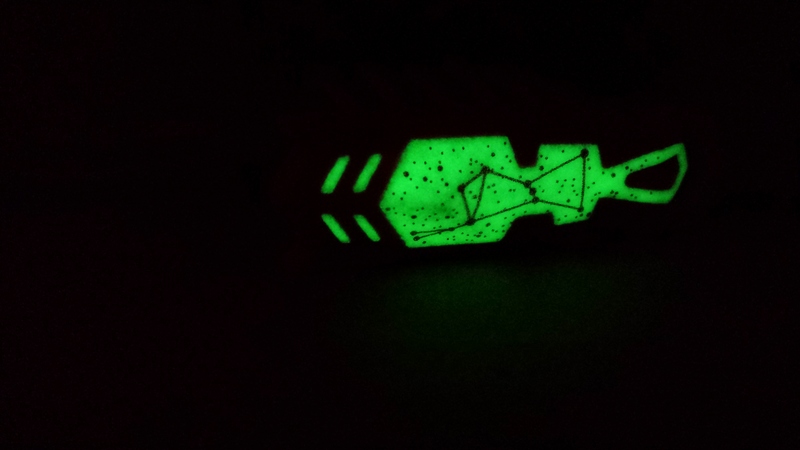 It’s easier to see when it glows in the dark.